Loy Sneary’s face lights up when he talks about his grandkids coming to visit. He says he puts them through “Cowboy Camp”—waking them up at dawn and keeping them out on the ranch ‘til dusk, herding cattle and exploring the outdoors. No television, no iPads—and by the end of the week, they don’t want to leave. I ask when I can send my own boys for a visit. In person, Loy commands a presence. He’s the embodiment of Texan class and charm. Tall and trim with a thick head of salt-and-pepper hair, Loy offers a firm handshake and a gentle smile to everyone he meets. I’ve pounded the pavement on Capitol Hill with him quite a few times, and the heels in his cowboy boots set off the metal detectors every time. He’s also the owner of a small waste heat-to-power business southwest of Houston that’s working on some pretty innovative projects. 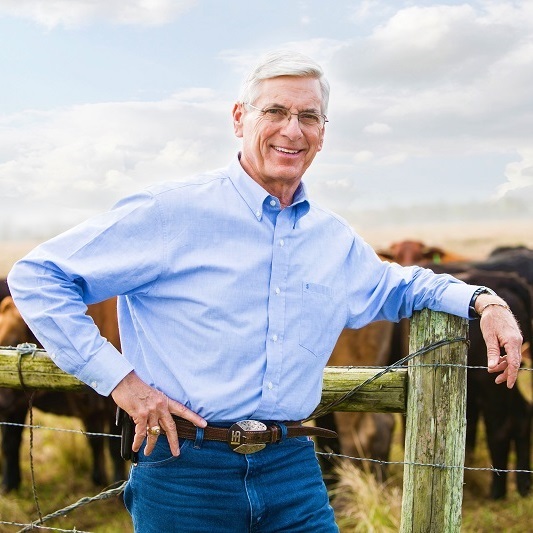 Before starting at Gulf Coast Green Energy, Loy spent years working at the nexus of industry and government—including as a county judge and community leader on sustainable development, land management, and ranching practices. He also did a tour in the Navy years ago, where he learned and began developing leadership skills. One of the most exciting applications of Loy’s work is in the oil and gas industry. Gulf Coast Green Energy and ElectraTherm worked on an innovative project with Hess Corp., the Houston Advanced Research Center and Texas A&M to capture flare gas off the Bakken oil field in North Dakota. They used the flare gas to fire a boiler, which delivered the hot water needed for the ElectraTherm Power+ generator to make power from the gas that would have otherwise been flared. This approach could be a new model for reducing flaring in oil fields, landfills, and wastewater treatment plants. Instead of wasting the natural gas, it could be used to reduce emissions and create an efficient source of electricity to power onsite operations or export to the grid. In 2017, a new report from Texas A&M verified the emissions reductions from this flare reduction demo project, finding that it cut CO by 89%, NOx by 48% and VOC’s by 93% compared to just flaring the gas. The State of North Dakota has also qualified the Power+ generator as an approved technology to make a beneficial use of gas that would otherwise be flared. While smoothing out the bumps in the road over these years, Loy has also enjoyed starting an all-volunteer non-profit to promote and encourage healthy lifestyles in his area of Texas. “Because our area is above national averages of all chronic diseases,” he says, “this has been a rewarding volunteer endeavor. After 15 years of raising, begging for and borrowing money and applying for grants we have successfully built a $7 million Wellness and Rehabilitation Center which serves our community and the surrounding area. It’s been very cool to be a part of bringing the community and area industry and businesses together for a common healthy life style goal.” Loy’s next volunteer project is to build a $13 million aquatics center for aquatherapy, student and adult athletes and recreational swimming. Loy approaches everything in his life—from his business, to his volunteer work, to ranching, to his family—with such heart. I’m not sure how he manages it all, but hope he finds time to add just one more thing to his plate: a Cowboy daycare. Watch this video about the flare reduction project demonstrated by Gulf Coast Green Energy and ElectraTherm. Hear more from Loy in Powering through the Storm, an episode of the CEBN’s podcast featuring clean and efficient energy technologies that can keep the lights on during natural disasters.